Cauliflower and Potatoes make a nice combination and can be eaten with Chapatis or Rice. Add the cauliflower pieces to the pan and fry, turning constantly until brown in spots (about 4-5 minutes).Remove from the pan. Mix the turmeric, chilli powder, coriander powder and cumin powder with 1 tbsp of water and make into a paste . Heat the oil in the same pan and add the cinnamon , cloves and cardamom. Saute for 1-2 minutes and then add the mixed paste into it and fry for 2-3 mins. Add ginger garlic paste and fry and then add the sauteed potatoes and cauliflower and salt. Mix well and fry for couple of minutes. Add the chopped tomatoes, sprinkle with little water and cover and cook the vegetables over low heat till they become tender. 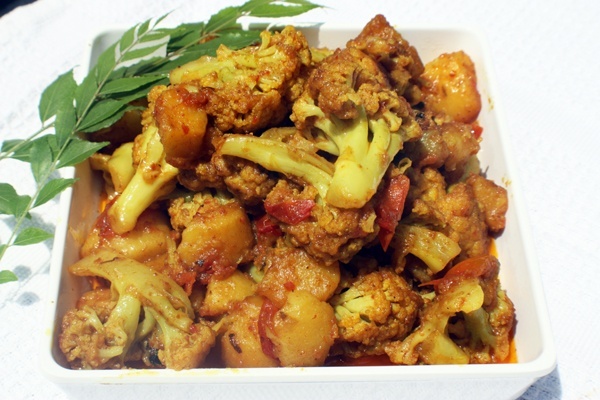 This entry was posted in Vegetables and tagged cauliflower, Indian vegetable by Kamakshi. Bookmark the permalink.